This book contains a wealth of information on six homeopathic remedies that will be of use to any homeopath seeking a simillimum for a patient. The pictures of Hawthorn, Mango, Oxygen, Sea Horse, Python and Crow are based on carefully conducted provings enriched by information on the substances from other sources. The analysis of the proving information into themes and the translation into repertory rubrics makes for easy accessibility. With at least one case per remedy the practical value of the proving information is illustrated making this book on the Quintessence of six substances complete. The homeopathic community is indebted to Chetna Shukla for this, the fruit of her dedication. Harry Van der Zee, MD, Editor-in-chief of Homeopathic Links. 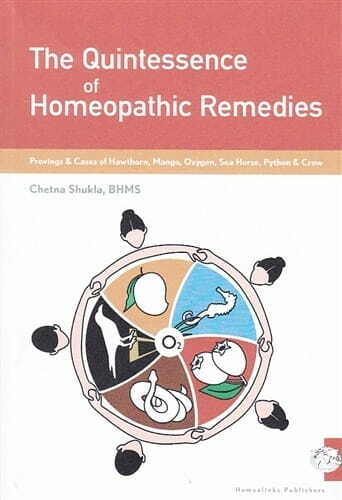 The author and 'Master Prover' Chetna Shukla is undoubtedly a passionate and dedicated individual, who sees the partaking in provings or homeopathic pathogenetic trials (HPT), as a near spiritual - ence. Her approach to methodology therefore try much based on feelings, rather than on existing protocols such as those based on the guidelines laid down by Hahnemann in the Organon Â§121 - Â§143, carved out into a modem applied form by Jeremy Sherr in his Methodology, further formulated into guidelines by the ICCH, ECCH, and the Society of Homeopaths here in the UK. In her book she has brought six different "individualising examinations" along to share with us, having worked with groups of provers numbering from four to eight, some of whom took part in more than one proving. Participants were chosen 'knowing' that the qualities needed in provers were there, as they were all people of her acquaintance. Each remedy is presented with some information on the substance itself, a short list of themes, some statements by provers, some rubrics and a case to show clinical verification. In the light of the current climate vociferously challenging us to focus more on our science than on our att, and to be more visibly accountable, one could criticise this book on many levels. 1 would have just thought it interesting to see a comparison with the provings that have already been carried out by others. However, I enjoyed reading this book as the account of a beautiful and simple intention - to share the joy of a very personal and direct experience of our art. order to understand it, with the impossibility of sticking a label called 'beauty' on any of the bottles. Her aim is not to dissect, but to present an individual and unique image of each proving. She therefore leaves the translation of the proving symptoms into rubrics to others, as she feels that "every mind has its own perception and sensitivity attuned to its individuality".